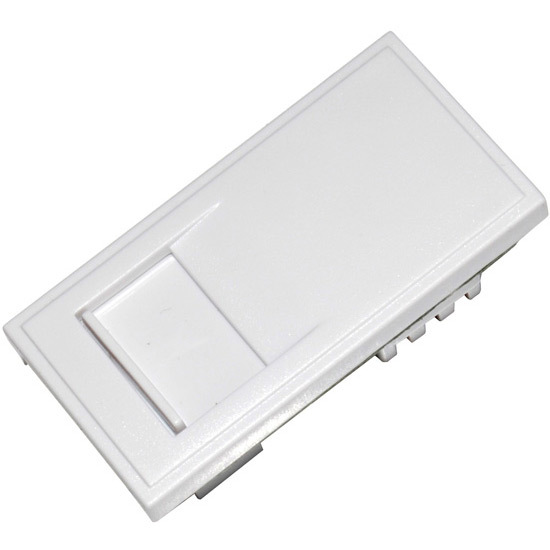 These modules are a standard BT socket for dedicated telephone outlets. The modern home is now more than a mere home. It doubles up occasionally as a cinema, concert hall, meeting venue and computer room etc.. Each of these functions brings with it its own unique requirements in terms of the provision of necessary services such as telephone or satellite sockets etc. Even in recent memory designers and builders did not think beyond providing a perfunctory level of electrical switches, sockets and pendant light fittings in a new home. Nowadays, as well as providing an ever increasing number of these items, provision must be made for the myriad different electrical and electronic products which proliferate our homes. Traditionally, products such as telephone and TV coaxial sockets etc. have all been supplied built into a standard size wall plate. The environment in todays office and home however requires a number of services to be provided to a specific work station or convenient access point. The most flexible and efficient means of doing this is the use of modules on a multiple aperture plate.